This is a late 16thC ear dagger heavily inspired by a piece in The Wallace Collection. These daggers almost certainly have a Eastern Mediterranean influence of 'the exotic' and as as such were popular in Italy, but also in Spain. They were popular in the 16thC and early 17thC and did spread across Europe in limited numbers. Henry VIII is shown in his fatter years wearing a rather splendid gold one. These are always interesting pieces to make and are always very slow and tricky pieces, and that must have been as true then as now, so this just adds to its high status as a weapon. These are never seen as lower class objects and as far as I know a 'munition grade' ear dagger does not exist. 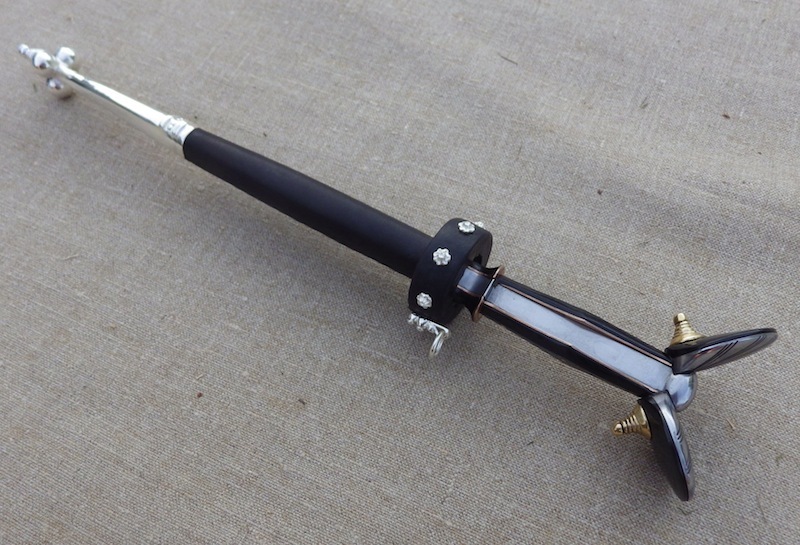 This example fits easily into the stylistic framework of ear daggers and as such all the features are pretty normal, so just take it as read that what I have done is usual for this type of weapon. The blade is thick at the hilt of around 8mm x 23mm and tapers down fairly evenly to leave a thick tip; the blade has a prominent ridge running down caused by the hollow grind and this makes for a very stiff armour piercing blade. 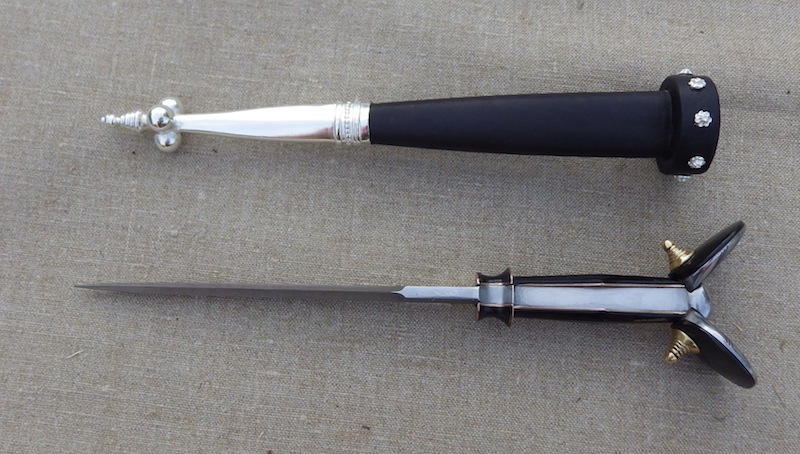 The ricasso is asymmetric and is also slightly hollow ground and the blade tang rapidly increases from around 8mm thick at the hilt to around 12mm at the pommel, where it swells out to form the bridge between the two ears. The tang clearly is parallel sided whereas the grip is not, so this leaves 4 prominent edges running down the grip. 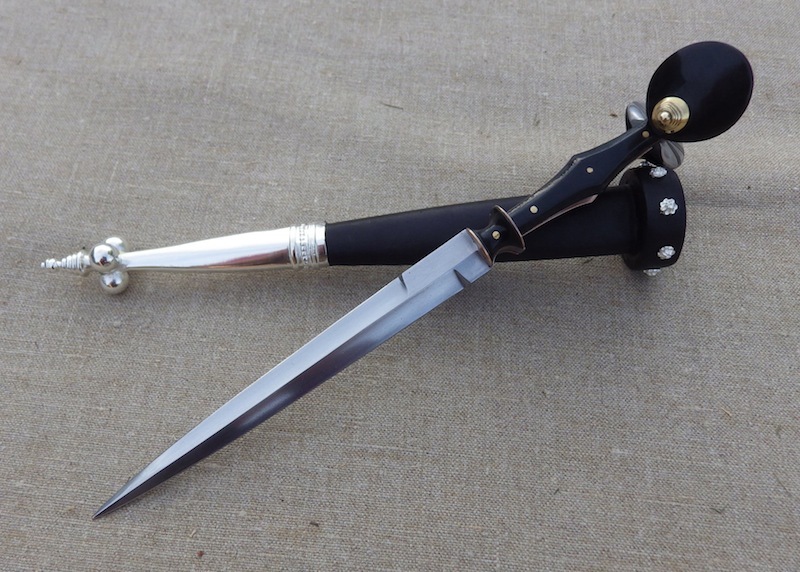 This looks uncomfortable, but not as bad as you may think, however it certainly does not have the comfort of a regular dagger grip. 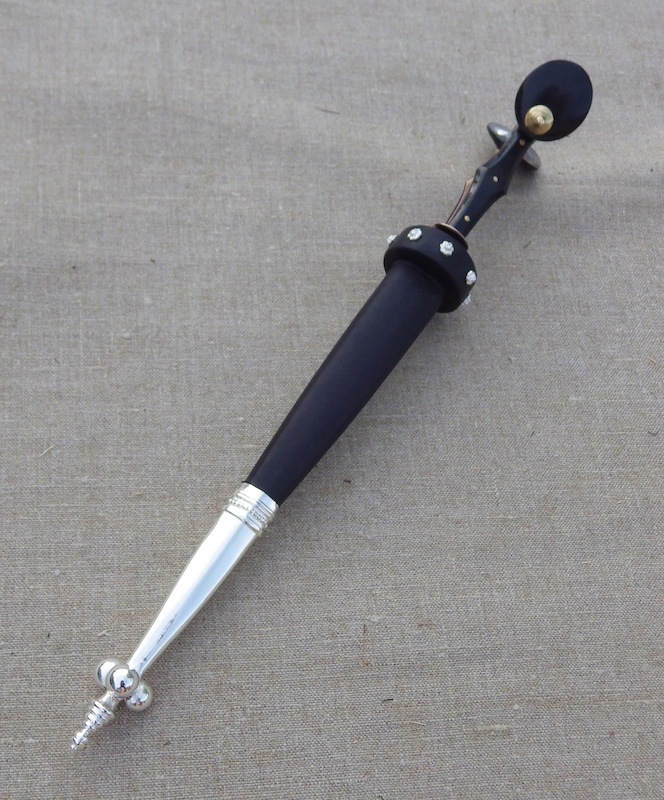 Note though that this dagger is not a tool to used often for long periods and so fashion has a large influence too and as all ladies who wear high heels will tell you or Homeboys with low slung trousers/pants; looking good often overshadows practicality. What is noticeable is that the ears and the overhand grip make for a very secure hold for hard stabbing strikes. The grip scales are made from horn and the scale liners are bronze. The ears are in steel with radiant lines cut in. 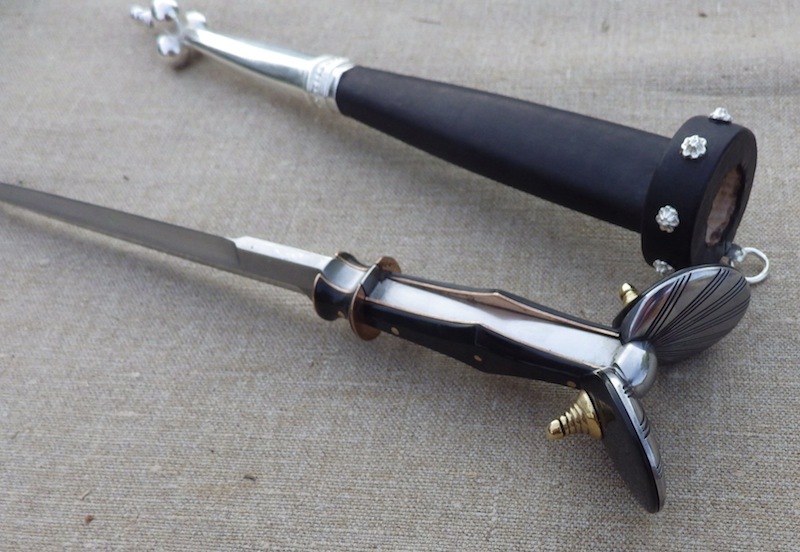 The scabbard is made in wood, covered with leather and has silver plated fittings. This scabbard has a hanging point but I believe that it was more common to simply thrust the scabbard through a belt and let the swelling of the disc stop it falling through. Either way the disc at the top of the scabbard was a common feature. I saw t his posted on Facebook several days ago and I must say it's stellar... absolutely stunning. Well done on an under-represented class. Those are thick tangs. Some examples in the FLG. Any idea of the symbolism or purpose of the teats on the ears? The studs on the ears are principally there to pin things together and this thread from a few years ago may help in some respects. This dagger though is put together slightly differently to the one shown. Another way is to pass a rivet through both ears and the tang using the studs as rivet washers in essence. Awesome, I really like the steel/bronze/horn layered effect. With regards to the symbolism/purpose of the teats, the ear daggers were based on very old iron/bronze age daggers from the middle east. In my opinion the teats were simply the remains of where the bronze was poured into the mold and I think that the Medieval recreations copied the teats without context though managed to incoporate them into the design as a useful part of the dagger. Ie as Tod says, pinning things together.